The beauty secrets of ancient Egyptians serve as a base for many modern beauty products, utilizing the same ingredients in new formulas to try to capture the flawless, legendary beauty of ancient Egyptian women. Egyptian Magic, however, goes a step further- rather than simply using key ingredients from the Egyptian skincare routines of days past, they’ve formulated products that are intended to exactly replicate the formulas used by the ancient Egyptians, allowing modern women and men to harness the skincare secrets of our ancestors! Egyptian Magic Cream is a multi-purpose balm that is formulated with exclusively natural plants and organisms, providing healing, nourishment, and hydration that have been used by Egyptians for thousands of years, a testimonial that few products on the market can claim. This deeply nourishing balm can treat a number of skin conditions, ranging from skin disorders like eczema and psoriasis to bug bites, athlete’s foot, and diaper rash. Perfect for use on any area of the body, this balm is a true all-around hero in the beauty industry. One of the most famous clients that Egyptian Magic claims has used their product may be a name you recognize: Cleopatra. It’s said that Cleopatra used this formula to maintain her otherworldly beauty, using it on her skin as well as her hair, to keep both hydrated, supple, and stunning. If it’s good enough for Cleopatra, a legendary beauty, it’s definitely a must have for anyone looking for a go-to beauty multi-tasker! Egyptian Magic’s healing benefits aren’t limited to the skin on the body or the face. This cream is suitable for use on the hair as well as a dry, itchy scalp, keeping you fresh, hydrated, and comfortable from head to toe. Smooth a bit of this nourishing cream on split ends to smooth or apply before bed for an incredible overnight hair treatment. Not dealing with anything particularly difficult skincare-wise? 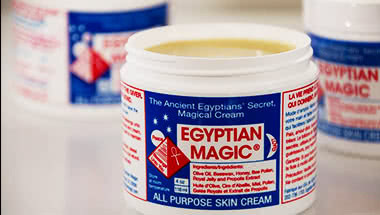 You can still benefit from using Egyptian Magic Cream. This cream is said to help improve the appearance of the visible signs of aging, helping to smooth fine lines and wrinkles and improve skin texture and tone. An incredible last step to an anti-aging routine, this cream will lock in moisture and provide you with perfectly hydrated skin! So take it from Cleopatra- this is the ultimate way to get incredible skin and hair with just one product! Check out the selection from Egyptian Magic to harness the legendary power of ancient Egyptian beauty today. Pretty expensive for what it is.. considering it's comparable to paw paw/ Vaseline in its purpose. Not really doing it for me to be honest..